Sometimes there are situations when it is necessary to increase the length of the power cable. In such cases it is customary to use special devices or to increase the twisted pair. How to compress twisted pair "computer - computer"
knife, duct tape, a connector. 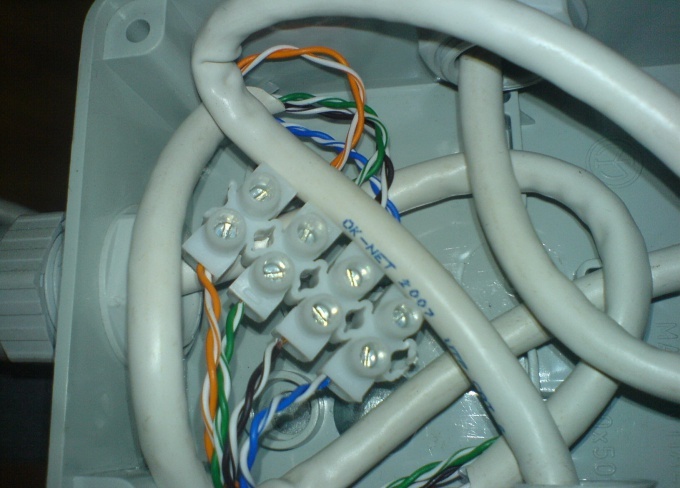 One of the simplest and efficient variant of the connection network cables – use connector. There are special miniature switches with two or three LAN ports. Connect both network cable to connect them. If you absolutely do not want to purchase additional equipment, or the opportunity simply is not possible, connect the network cables yourself. Cut one end of each cable. Clean off the outer insulation a short period of a network cable. You will see eight wires in the braid of different colors. Remove the insulation from each wire. Make it so that you could see the color of the braid on each individual item. Do not cut the wire at the same level. If you've cleared, say, twelve inches cable length each wire should be 2, 4, 6 cm and so on. Pairwise connect each wire to its counterpart. Isolate each such strand with a special tape. The common connection also wrap with tape to prevent breaking twists. All operations of circumcision and the connection wire only needs to be performed with the network cables disconnected from other devices. Some types of network cables are capable of transmitting information only four wires. If you are not sure what you are dealing with such cable, connect all eight lived. Avoid very long twists. Try to connect to create as little of such connections of the network cables because it leads to a decrease in data transfer speed.